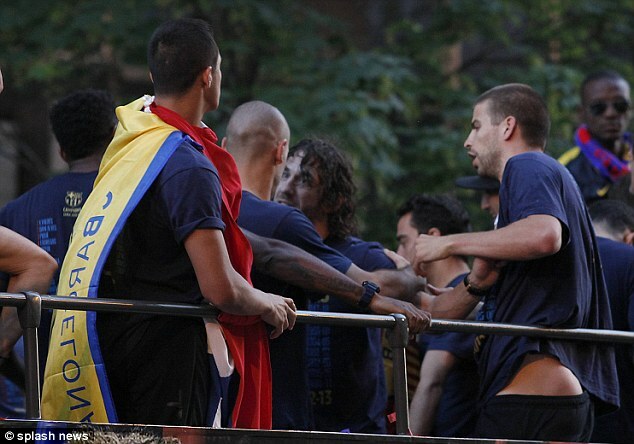 In a big show of shame, Barcelona stars Gerard Pique and Alex Song were pictured to have been throwing blows at each other while on top of the team's double-decker bus to celebrate their La Liga triumph. 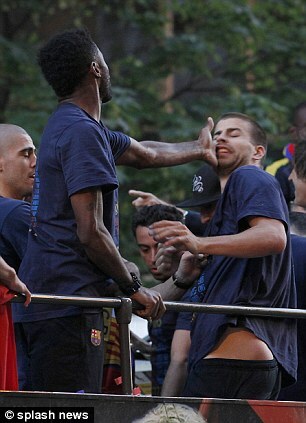 The former Arsenal midfielder Song and Pique seem to be fighting while the bus makes its way around the Catalan city of Barcelona. At one point, Song is seen grabbing Pique's arm and cocking his clenched fist as if readying himself to throw a punch at the Spain defender. The former Manchester United centre half winces while holding his arms up in defence. In another shot, Song is captured landing an open-handed slap on his team-mate as Puyol and Valdes watch. Skipper of the team Carles Puyol and goalkeeper Victor Valdes who look to be playing peacemakers in the end, appeared to be having a heated discussion of their own in the background as their team-mates grapple in front of celebrating supporters. There is a possibility that the superstars are simply larking about as footage shows how the bus parade turned into a party with plenty of beer-drinking on show from the Spanish champions. But based on these images, the pair look to be seriously quarrelling atop the coach. Although the scuffle went unnoticed on Monday afternoon, politicians in Catalonia have complained that drinking on the bus was setting a bad example to young fans who watched their title-winners parade the trophy. The parade was to honour Barca reclaiming their La Liga crown from Real Madrid, after mounting a 10-point lead with three games to play. Song, who operates as a holding midfielder, has made 19 appearances since joining last August. The Indomitable Lions of Cameroon midfielder has struggled to force his way into a midfield that boasts world-class talents Xavi, Sergio Busquets and Cesc Fabregas and was in January voted one of the worst signings of the season behind Real Madrid's Luka Modric.